A new study has important health advice for all cancer patients. It turns out that the hospital where you receive treatment significantly influences your recovery and survival rate. If you have options, it would pay to consider them. The researchers looked at nearly 1,200 patients with advanced head and neck cancer in the U.S. They discovered that patients in hospitals that routinely saw such cancers (thus, dealt with them more regularly) were 15% less likely to die from the disease, compared to patients treated at hospitals that saw a low number of head and neck cancer patients. They also found that patients were 12% less likely to die in a federally designated cancer center. This is all to say: where you get cancer treatment matters—a lot. More than 52,000 Americans were diagnosed with head and neck cancer last year. “Advanced disease” means it has spread, often to the lymph nodes, and that means there is a much worse prognosis. Expert guidelines suggest that these patients be treated by many different specialists and get multiple different treatments (called “multimodality therapy”). The researchers were surprised to learn that the recommended multimodality therapy was being used at about the same rate (78%–79%) at both low-volume and high-volume hospitals. So, clearly, that wasn’t the reason behind the risks for death. RECOMMENDED: This exercise helps prostate cancer survivors. While the study didn’t explain the reasons for the differences, the facts speak for themselves, and we can all learn from them. If you face a battle against cancer, it pays to do your homework. If you live in a region where you have multiple options as to where you receive treatment, find out if the hospitals have a multimodality approach. 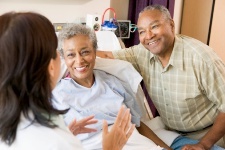 Ask your physician about his or her opinion on hospital options. Research if the hospital or doctor you’re considering specializes in a particular type of cancer treatment. You can also ask friends or co-workers for recommendations, and check with your insurance provider which treatment plans they cover. Finally, don’t forget to see if the hospital will provide any support groups. It can make a big difference, as this study shows. And it’s well within your rights as a patient to understand which hospitals or cancer care centers may be best for you. Sharma, A., et al., “Hospital Volume is Associated with Survival but not Multimodality Therapy in Medicare Patients with Advanced Head and Neck Cancer,” Cancer; published online March 1, 2013.